Ford assembly plants and dealers in the Detroit suburbs, such as Bill Brown Ford of Livonia, Mich., pictured, dug out quickly from Tuesday's winter storm. DETROIT -- Production has resumed at most North American auto plants after a massive snowstorm swept across the United States and parts of Canada, forcing closures and causing parts shortages. Chrysler Group LLC, General Motors Co. and Ford Motor Co. canceled first shifts at 26 plants Wednesday, although most were open for second or third shifts. Subaru of Indiana Automotive, Honda Motor Co. and Toyota Motor Corp. also reopened today. 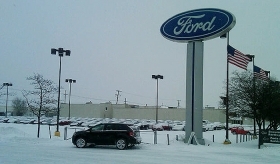 Ford's Chicago Assembly Plant remained closed today for the first shift because of impassable roads. Some automakers have been forced to adjust shifts to make up for lost production. At the Subaru plant in Lafayette, Ind., first shift employees started at 8 a.m. today instead of 6 a.m. and will work later. Spokeswoman Jennifer McGarvey said roads were clearer later in the morning. The plant produces the Outback, Legacy and Tribeca, as well as the Toyota Camry sedan. GM's Flint, Mich., assembly plant lost first shift production Wednesday, but reopened for other shifts later. A first shift has been rescheduled for Friday, when the plant was going to be closed. The Flint plant produces the Chevrolet Silverado HD crew cab and LD regular cab as well as the GMC Sierra HD crew cab and LD regular cab. Parts of the operation line at Ford's Dearborn Engine Plant continued to run Wednesday while the rest of the plant was closed. The plant was scheduled to be down Friday, but it will remain open to catch up on F-series chassis production. In total, 33 facilities were down for first shifts Wednesday, many because of parts shortages caused by icy, snowy roads. Chrysler canceled first shifts at 12 Midwest and Canadian plants because of weather-related parts shortages. All but the Belvidere, Ill., plant were reopened for second shifts. Ford reported parts shortages at four auto plants, including Dearborn, Mich., Truck (F-150 and Harley Davidson F-150); Lima, Ohio, Engine; Kansas City, Mo., Assembly (F-150 pickup and Escape and Mazda Tribute); and Ohio Assembly in Avon Lake (E series vans). Subaru and Toyota's Princeton, Ind., plant also canceled shifts because of parts shortages. Toyota produces the Sequoia SUV, Sienna minivan and Highlander crossover in Princeton. Neil De Koker, CEO of the Original Equipment Suppliers Association, said delivery of parts was more of a problem than production. “A number of parts are just-in-time delivery and even if you are making parts, if the roads are bad it's difficult to get it delivered,” he said. Supplier Delphi Corp. said it had to adjust schedules for just-in-time delivery components, but all of its plants were running. The situation was similar at Robert Bosch LLC, where operations were continuing as normal. In some cases, the storm could help suppliers that may have fallen behind in production, De Koker said. Many plants were facing parts shortages before the snow and ice hit. “To the extent that the suppliers will be able to get people in their plants to actually produce parts, it does give some of those suppliers a chance to catch up,” he said. If the real issue is shortages of raw materials like steel, rubber and resins, De Koker said, then a snowstorm probably wouldn't have much effect overall. As far as sales, the canceled shifts shouldn't play a role either, said Mike Jackson, a forecaster with IHS Automotive. “Even in December there were already some pretty heavy storms so as far as limiting availability or limiting showroom traffic, the fact that January came in as well as it did is quite positive,” he said. January ended with vehicle inventories hitting the 2.4 million-unit mark, prompting IHS to raise its 2011 North American production outlook up 1 million units to 12.9 million. This was compared to a 2.1 million-unit inventory for this period last year. Jackson said February would be a test as automakers bolster supply heading into the spring selling season.